It’s quite common for those with Alzheimer’s and other forms of dementia to experience sleep problems. They often can’t fall asleep and are restless throughout the night. What makes it even worse is that inadequate sleep can actually worsen dementia – it can be an endless cycle. Caregivers cite night wandering and confusion as the most frequent causes of senior living placement. Unfortunately, the problems often persist even after a person has moved to a residential care setting. Patients may be given medication to help them sleep, which only acts as a band-aid. No one knows for sure why sleep problems and confusion at night occur in dementia patients. All that’s known is Alzheimer’s affects the brain, causing cognitive problems. Studies indicate that up to 20 percent of people with Alzheimer’s experience sundowning, which is increased feelings of anxiety and confusion late in the day. These individuals also frequently experience restlessness and trouble sleeping, which can contribute to increased behavioral problems. Sleep apnea is another highly diagnosed condition experienced by dementia patients. Professionals believe that sleep apnea is related to severe dementia. It’s been found that Alzheimer’s patients experience several respiratory events for every hour of sleep, caused by sleep apnea. Medical conditions and certain medications and also affect patients. A lot of adults experience sleep difficulties caused by another issue. Taking a closer look at medications and other health problems could reveal more about the sleep issues. Fortunately, there are several lifestyle changes that can promote healthier sleep. Encourage your loved one to start implementing these habits to help them overcome difficulties with sleeping. 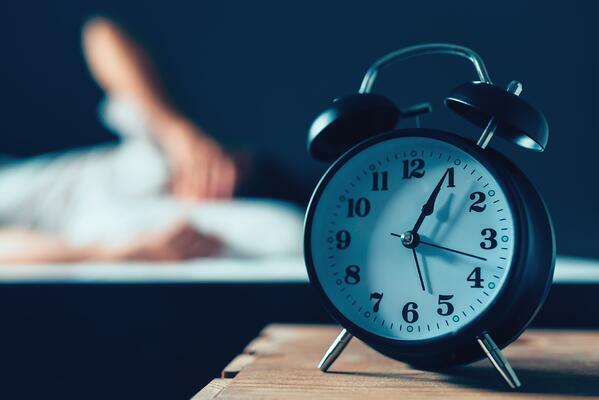 Maintaining a consistent sleep schedule with a regular wake-up time can greatly improve circadian rhythm, helping dementia patients fall asleep faster and have a higher quality of sleep. It’s best to go to bed at the same time every night too, although the time you wake up has a bigger impact on overall sleep quality. Adapting to a new sleep schedule can be difficult, especially for those with dementia. With the use of alarms and assistance from caregivers, getting out of bed at the right time each day can make a big difference in their ability to fall asleep more readily at night. A nutritious, well-balanced diet is important for just about everyone, including dementia patients and seniors in general. It’s important not to eat large meals too close to bedtime, and anything eaten after 6:00 PM should be healthy, meaning low in sugar and carbs. There are certain foods you can eat around bedtime that actually help you sleep. For example, calcium is known to help the body produce more melatonin, a natural hormone that induces sleepiness. So, consider having a glass of milk before bed. Another food to consider eating is oatmeal. It's also crucial to avoid tobacco, alcohol, caffeine, and high-fat meals at night. These can make it nearly impossible to fall asleep. If you’re used to having a nighttime tea, consider something with zero caffeine. Many seniors have a hard time exercising due to mobility issues. However, it’s even more important for them to do what they can, as aging causes the body to lose bone and muscle. Also, exercising during the day can help you to more easily fall asleep when the time comes. Exercise doesn’t have to be too rigorous – even a light walk will do the trick. Walk as often as possible during the day and squeeze in some light weightlifting if you can manage it. Before bed, do a few stretches. Make the bedroom a place made just for sleeping. Use the room only for sleeping – if you start to play or work in there, your mind won’t automatically shift to sleep mode when you’re in bed. Your bed should be used for sleeping only. Keep your bedroom as dark and quiet as possible when you should be sleeping and adjust the temperature to something you like. If the bed is uncomfortable, find the problem and fix it as best as you can. There are mattress pads and special pillows available for all types of sleepers. It’s just a matter of finding what works for you or your loved one. Exposure to light during the day, typically in the form of the sun, can help keep the circadian rhythm on track. When the sun sets, the body typically knows it’s almost time for bed. If you’re unable to get the patient outside during the day, light therapy has been found to be effective for some people. This involves using special lamps outfitted to emulate sunlight. Studies indicate that light therapy works best to alleviate sleep issues for those with mild to moderate dementia. Problems with sleeping are common among those with dementia or Alzheimer’s disease, but implementing a consistent evening routine and other habits can support healthy sleep. If lifestyle changes don’t ease your loved one’s sleep problems, talk with their healthcare provider to discuss other solutions.